Having the talented choreographer Jessica Lang on hand Saturday night as her outstanding young company gave a stellar performance at the Duncan Theatre turned out to be a bittersweet affair. The audience, freshly in love with both Lang’s choreography and the ensemble, learned in the post-performance talk-back that the 8-year-old company would disband in April. That evening’s performance had been one of the last opportunities to see a full evening of Lang’s works danced by dancers she had hand-picked to embody her choreographic vision. Though Lang will continue to choreograph, she will focus solely on being a guest choreographer for other dance companies such as American Ballet Theatre and Alvin Ailey Dance Theater among many others. Lang, who often sits in the audience to absorb audience reaction, put on a stylish program that presented some of her earlier works together with some more recent works that she had made specifically for her company dancers. Spanning from classical modern dance style to a more contemporary look, the program ended with an upbeat but vaguely unsatisfying work that paid homage to crooner Tony Bennett. The evening, which was peppered with short solos and excerpts, highlighted the individual artistic qualities of the nine accomplished dancers that comprised Jessica Lang Dance. The athletic and nuanced dancer Patrick Coker was outstanding in Solo Bach (2008), the very short work that opened the program and was performed to the Partita No. 3 (in E) for solo violin of J.S. Bach. A short excerpt from Lang’s 2010 work Aria followed. The somewhat classical but quite lovely female trio was set to the beautiful voice of Lorraine Hunt Lieberson singing “Qual nave” from George Frederic Handel’s opera Radamisto. Looking like kayatids – the goddesses that the Greek sculptors immortalized in white marble that were once painted vivid colors – Eve Jacobs, together with Julie Fiorenza and Laura Mead, danced bathed in golden light in front of a vivid blue cyc dressed in flowing red, ombré-shaded toga gowns. Jacobs also presented a striking image in “The Calling,” a too-brief excerpt from Splendid Isolation II (2006), as she arched and spiraled, twisting her strong torso that was caught in a resplendent circle of white draped fabric that kept her bound in one place. 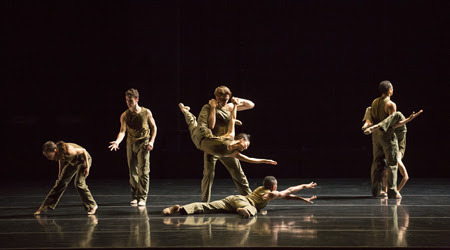 All these snippets were just tantalizing appetizers to the backbone of the program, Thousand Yard Stare, which was a satisfyingly well-crafted, 20-minute, full-company work that Lang choreographed in 2016. The dancers, dressed in unisex, quasi-military wear, faced each other from the sides of a stripped stage staring into stark side lights. In silence, they introduced a simple, slow march-like series of steps that ended frozen in a one-leg stance which they repeated with precision and determination. The simplicity was mesmerizing and effectively set up the mood for a work that was culled from a series of interviews and interactions that Lang had with veterans. Hearing their stories of war, she translated them into a vocabulary of movement that resonated. Moving, clapping and stamping between and through the notes of the slow movement of Beethoven’s String Quartet No. 15 (in A minor, Op. 132) as performed by the Takács Quartet, the performers danced brilliantly, filling the stage with striking images and excellent ensemble work. Thousand Yard Stare, a finely honed work, subtly captured the long-lasting effects of war on all of humanity. Flipping the mood after intermission to bright and lights, five dancers wearing astro-green sneakers and white lycra pants and tops buoyantly moved around and – at times – over a long snake-like shape that slowly changed colors. Composers Owen Clayton Condon and Ivan Trevino each contributed one selection of lively music to glow (2017), which was originally intended to be performed just for children. Rachael Secrest, an excellent dancer who led the other dancers through their light-hearted, fun movement, returned at the end of the piece wearing sneakers that had LED lights in their soles. The rapidly changed colors on Secrest’s moving feet one-upped the light show that the set piece had introduced. This Thing Called Love (2018) was the rousing ensemble finale. The 22-minute work was a result of another series of interviews and interactions that Lang had with fellow Queens artist Tony Bennett. Using a medley of five popular Cole Porter tunes sung by Bennett, the closer was energetic and snappy, but it seemed forced and lacked cohesion. Choreographed in musical theater style, the work still had Lang’s nimble touch but it wasn’t the same caliber as Thousand Yard Stare. The segments were stitched together with recordings of Bennett talking and projected visuals of some of Bennett’s paintings (which he signs with his real name, Anthony Benedetto). Perhaps if Milan Misko, the main character who personified Tony Bennett, had exuded more charisma and/or movement prowess, it might have helped focus the work but my eye kept being stolen by the extraordinary mover Jammie Walker and equally engaging dancers Secrest and Coker. This Thing Called Love was dessert for those who have a sweet tooth. Kana Kimura and Thomas Ragland, both wonderful dancers, were the two other company members who greatly added to Jessica Lang Dance’s fine performance Saturday night. It is sad to realize that we will not see this excellent young company perform again, but there is no doubt that we will see much more from Lang as she continues exploring her artistry, expanding her creativity and setting her choreography on major dance companies around the world.